Healing Iraq – blogosphere, cell phones and web. Internet dating in Iraq made the headlines today on Boing Boing with a snip from a Los Angeles Times piece about internet dating, and the online sociology of war zones. 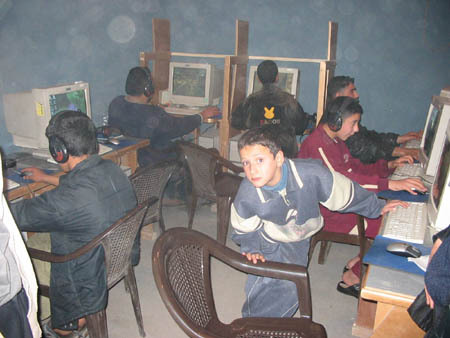 But, the internet and cell phones have become the main connection to family, friends and a normal life for Iraqis. There have been several interesting reports in recent months on how wildly popular cell phones have become in Iraq. USA Today writes on how people in Baghdad rely on cell phones to text-message traffic reports to friends or keep track of family members navigating dangerous streets. The Iraqi blogoshere has been developing as a forum for healing Iraq, despite the obstacles. The picture I have posted here comes from Healing Iraq, a blog by Zeyad. Stay tuned for more posts on this topic, and let me know of anything interesting you find too. I will be following how ordinary people in Iraq are using the internet, cell phones, and connecting to the blogosphere to make the best out of a bad situation, and to heal their country. And, please keep your eye out for the upcoming launch of Hometown Baghdad – a web series that will bring you closer to everyday life in Iraq than anything you’ve seen before. I just happened to see your blog on mybloglog and decided to visit. It seems like a great place to me. I’ll be coming here regularly. Nice job.